Below are the steps for the investigation and review process. A. In cases where the student does not dispute the facts upon which the charges are based, SCAIP, upon receipt of the Academic Misconduct Referral form, will follow up with the student in writing to formally advise the student of the academic sanctions assigned by the instructor as well as appropriate disciplinary sanctions assigned by the University. The decision shall be forwarded in writing to the student within 20 calendar days of the review; and communicated to the instructor, school or college and/or division in accordance with legitimate educational interest criteria as articulated by the Family Education Rights and Privacy Act. Students with a record of previous academic misconduct will be referred to the Academic Integrity Committee in their School or College for a formal hearing (Review Stage 2) hearing, with a recommendation that suspension or dismissal be considered. B. 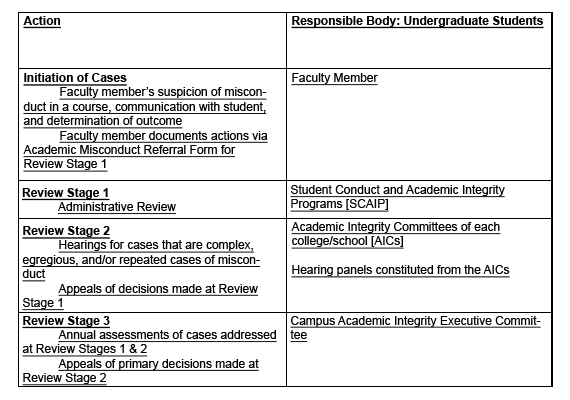 In cases where the student disputes the facts upon which the charges are based, upon receipt of the Academic Misconduct Referral Form, SCAIP will notify the student of their alleged violation of the University of California Policy on Student Conduct and Discipline, the factual basis for the charges, and the plan to conduct a Review Stage 1 Administrative Review of the case. The student will be advised that the Administrative Review is intended as a thorough exposition of all related facts and written materials associated with the alleged misconduct, and that it is not intended as an adversarial criminal or civil legal proceeding. It is not modeled on these adversarial systems; nor does it serve the same functions; rather, it is an academic process unique to the community of scholars that comprise a University. The student will also be informed of his or her right to be assisted by an advisor of his or her choice. Such written notification will occur within 20 calendar days of the receipt of the referral by SCAIP and will be sent to the student’s University e-mail address. The Administrative Review conducted by SCAIP involves meetings with the student, the Faculty member, and others who may have relevant information. The student will have the opportunity to discuss any extenuating circumstances, causes, and motivations that may have contributed to the alleged misconduct. If SCAIP deems it necessary, the Administrative Review will be scheduled such that both the faculty member and the student can attend. The purpose of an Administrative Review is to explore and investigate the incident giving rise to the appearance of academic dishonesty, and to reach an informed conclusion as to whether or not academic dishonesty occurred. In keeping with the ultimate premise and justification of academic life, the duty of all persons at a Review is to assist in a thorough and honest exposition of all related facts. A Review is not in the character of a criminal or civil legal proceeding. It is not modeled on these adversarial systems; nor does it serve the same functions; rather, it is an academic process unique to the community of scholars that comprise a University. If SCAIP determines it is more likely than not that the student is responsible for academic misconduct, the academic sanctions recommended by the faculty member as well as appropriate disciplinary sanctions will be assigned taking into account the clarity of course expectations, the level of the student's experience or knowledge of principles of academic integrity, the nature of the assignment, and the degree of intentionality and premeditation of the misconduct. The decision shall be forwarded in writing to the student within 20 calendar days of the review and communicated to the instructor, school or college and/or division in accordance with legitimate educational interest criteria as articulated by the Family Education Rights and Privacy Act. In cases where the instructor has held a grade in abeyance pending the outcome of an Administrative Review, she or he shall submit a final grade with the Registrar that is consistent with the decision of SCAIP as to the question of misconduct. 3. Appeals of Decisions by Faculty Members and/or from Review Stage 1. Academic Integrity Committees, described in Section C function as the appellate bodies for decisions made at Review Stage 1. Section E below more fully explains appeal procedures.